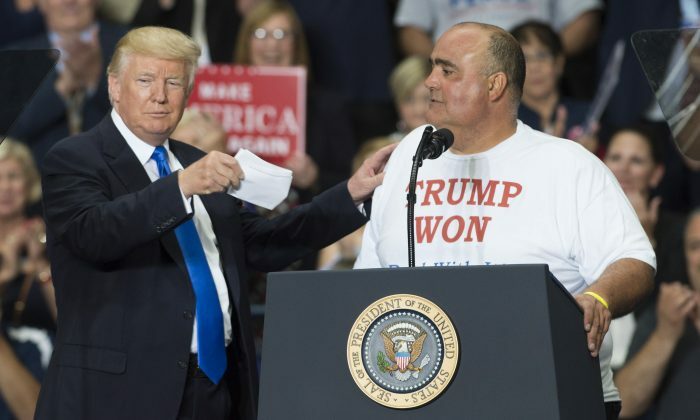 A panel of former Democrats from Youngstown, Ohio, shared their views with CNN one year after they switched parties to vote for President Donald Trump. Some 7,000 people switched party affiliations, from Democrat to Republican, in Youngstown last year. The locale may have something to do with it: closed factories dot the landscape and the local population has dropped by two-thirds since the 1950s. “I realized that the core foundation of the country was slipping away,” Rick Green, an ironworker, told CNN. “It got to a point where I did not like the direction my country is going,” another Ohio resident told the network. The five people CNN gathered voted for Trump hoping for change. “He said he’s gonna make America first and he’s gonna bring jobs back,” Derrick Anderson, a pastor, said. A year later, every one of the five former-Democrat Trump voters couldn’t be happier with the job the president is doing. “One year later, how is he doing?” CNN’s reporter asked. “Better than I ever would’ve dreamed, sincerely,” one of the panel’s members said. “Great,” “fantastic,” and “phenomenal” were words the rest of the panel used. “He’s doing wonderful, he’s staying on task,” Anderson said. All of the participants said that illegal immigration is an important topic for them, drawing surprise from CNN’s reporter. All five members of the panel said they still want the border wall to be built. On Thursday, Trump tweeted that he isn’t backing away from his promise. The panel also had no issues with Trump’s innovative use of Twitter to directly reach out to his followers. The president’s tough and direct language continues to draw ire from his opponents, but even his supporters who used to cringe at his Tweets are beginning to understand Trump’s unorthodox style. Harrison, a black woman, met Trump at a rally and said he is not a racist, as claimed by political opponents and some media. “He was the nicest person,” she said. Since coming to office last year, Trump has delivered on a number of campaign promises while driving the stock market to an all-time high, with 94 record closing highs since the 2016 election. Unemployment is at an 18-year low overall and is the lowest in recorded history for blacks and Hispanics. “Despite some very corrupt and dishonest media coverage, there are many great reporters I respect and lots of GOOD NEWS for the American people to be proud of!,” Trump tweeted on Thursday.